At Home Stores declared August 14-21st National College Move-In Week in an attempt to capitalize on the 200+ colleges and universities welcoming students back to campus. BSM Media highlighted the week through social media engagement with colleges, co-eds and moms of college students as well as a cross-country road trip taking our CEO, Maria Bailey, to 7 different campuses and 6 At Home Stores. At each store, At Home hosted local influencers, bloggers, and media who received a tour of the store and explanation of the new 2016 Campus Collection. All social media was tracked via #CollegeMoveIn and #AtHomeStores. 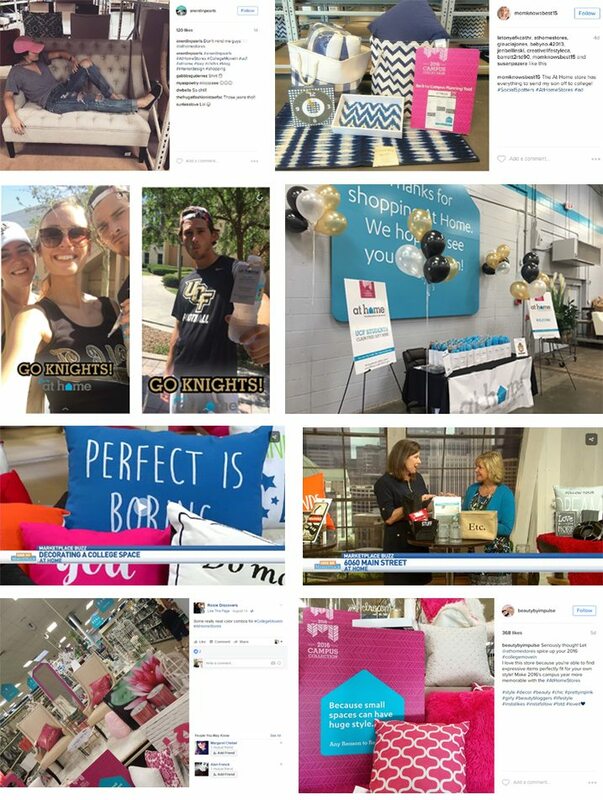 The 2401 mile road trip concluded at the University of Central Florida At Home Store, where a street team from BSM Media handed out branded bottles of water to families moving into dorms, hosted an in-store influencer event, product giveaways, free gifts to students visiting the At Home Store and encouraged kids to use the UCF-AT HOME Snapchat filter.